What would you rather spend $30,000 on - a brand new Chevrolet Cruze or Ferrari’s coffee table book that celebrates the car company’s foundation year of 1947? That may be a hard question for some. Even though we've already seen a $19,000 bathtub, this seemed like a little too much. Taschen’s new retrospective book on Ferrari is limited to 1,947 copies and can cost up to $30,000. While not all copies will be sold for the high sticker price, there will be a special selection of 250 Art edition copies that go for as much. These special copies include a sculptural steel and chrome bookstand along with a copy of the book enclosed in an aluminum display case, both of which were designed by the Australian industrial designer Marc Newson. 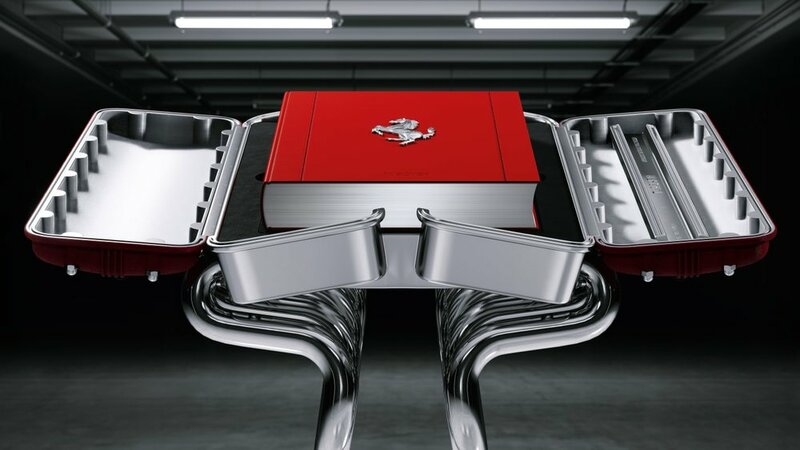 Together, the bookstand and case were built to replicate the shapes of a Ferrari 12-cylinder engine. The remaining 1,697 Collector's edition copies, are being sold for $6,000 each and only come with the aluminum case. The coffee table book itself is quite large – sized at 12.7 by 17 inches and has 514 pages. The exquisite piece of literature is of course hand-stitched with a minimalistic cover showcasing a silver horse over a racing red background. All copies sold are signed by Piero Ferrari, the company's vice chairman and the only living son of founder Enzo Ferrari. The $30,000 copies carry the signatures of the late Sergio Marchionne, who was the CEO of Ferrari and its former parent company Fiat Chrysler, as well as John Elkann, Ferrari's current chairman. Pino Allievi, a longtime Ferrari historian who worked with Enzo Ferrari on the 1998 book Ferrari Racconta edited the book. The book itself contains hundreds of unseen drawings, photographs and sketches from the Ferrari Archives, original documents of famed Ferrari drivers, as well as private collections from around the world. The book will simply be titled Ferrari and is set to be published in October. Let us know what you think about this legendary $30,000 book by Ferrari in the comments section below and be sure to subscribe to The Sitch for more Ferrari news and other entertaining reads.